Catcher Rasheeda Crews threw out a BC runner in the top of the seventh and then hit the game-winning single in the bottom of the frame. Photo by Wayne Gehman. For the all the hype for Thursday’s doubleheader with rival Bridgewater College at JMU’s Veterans Memorial Park, the Lady Royals came out a little flat. EMU dropped the opener, but came from behind in the nightcap, taking a 3-2 win with a run in the bottom of the seventh. Despite being out-hit only 10-8, Eastern Mennonite couldn’t plate a run in the first game. The women started out rocky, giving up two runs in the top of the first. After going down in order in the bottom of the first, the Royals’ defense let them down in the second. With two runners on and two away, Brooke Hensley (Elkton, VA/Spotswood) bobbled a grounder to short, allowing a run to score and letting the inning continue. The Eagles took full advantage of the miscue, following with a three-run homer from Leigh Lam (McGaheysville, VA/Spotswood) to vault the lead to 6-0. EMU had runners on second and third with only one away in the fourth, but a strikeout and groundout left them stranded. Bridgewater got a solo homerun from Morgan Williams (Richmond, VA/Varina) in the sixth to up the score to 7-0. The women left the bases loaded in their half of the sixth and BC brought in one more in the seventh for the final score. Lisa Lee (Buckingham, VA/Buckingham County) went the distance for the Lady Royals and took the loss to slip to 6-2. She gave up 10 hits, walked four, and watched her defense commit three errors. Seven of EMU’s eight hits were singles. Courtney Allman (Mt. 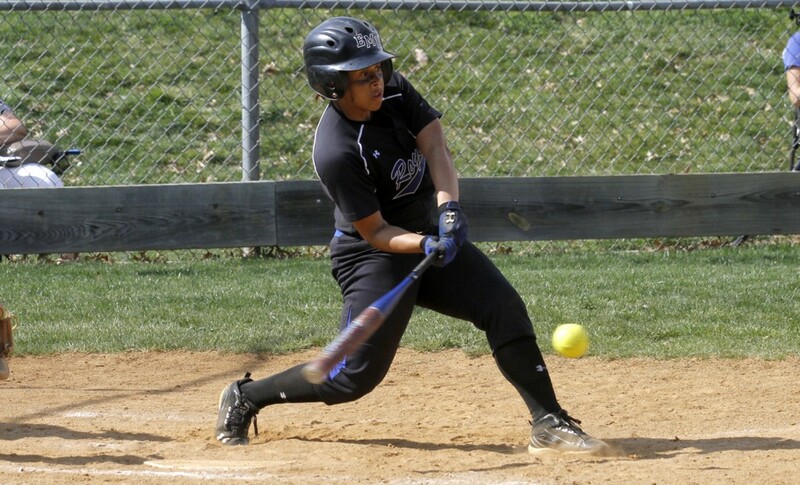 Solon, VA/Fort Defiance) and Rasheeda Crews (Brookneal, VA/William Campbell) each had two hits. Jordan Aylor (Madison, VA/Madison County) had a double. The women settled down by game two and took a 1-0 lead in the bottom of the first. Lee led off with a single and after a BC error came in on an Allman sacrifice fly. EMU starter Molly Smith (Elkton, VA/Spotswood) took a no-hitter into the fifth, but then gave up a double and single as the Eagles tied the score at 1-1. Bridgewater took a 2-1 lead in the top of the sixth and had the bases loaded with one out. Aylor took over for Smith in the circle and successfully kept the deficit at one run with a strikeout and a groundout. Lee tied the game in dramatic fashion to lead off the bottom of the frame, crushing a pitch nearly 250 feet to straightaway center. It was her fourth homerun of the season. BC speedster Kasey Anderson (Chatham, VA/Chatham) drew a one-out walk in the seventh, but Crews gunned her down trying to steal second. The momentum of throwing out Anderson for the first time after 20 successful attempts this season carried over into the bottom of the inning. Sara Jenkins (Stanley, VA/Page County) led off with a double to the right center gap. Katarina Napfel (Berkeley Springs, VA/ Berkeley Springs) came in to run, and sped around to score the game-winning run when Crews shot a single up the middle. Game two was more of what the crowd of 587 expected to see on the big stage, with EMU having five hits to BC’s four. Lee finished 2-3 out of the leadoff spot, scoring twice and collected one RBI from her homerun. Hensley, Jenkins and Crews had the women’s other hits. Smith pitched four no-hit innings and settled for a no decision as she allowed two runs in 5-1/3 innings. Aylor struck out one and walked one in 1-2/3 innings of relief to earn the win and improve to 6-1. Eastern Mennonite moves to 16-3 on the season while No. 24 Bridgewater goes to 16-2 after the doubleheader split. Both teams are also 1-1 in the ODAC. The Lady Royals are on the road this weekend, playing two at Sweet Briar on Sunday.